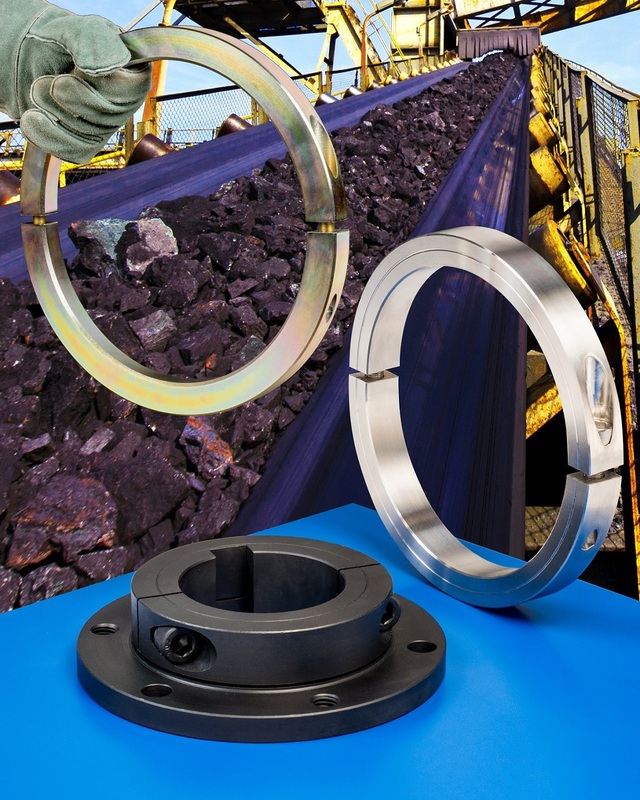 A line of large bore shaft collars and flange mounts for construction equipment, processing and mining conveyors, energy applications, and more are available from Stafford Manufacturing Corp. of Wilmington, Massachusetts. Stafford Large Bore Shaft Collars are designed for heavy-duty drive system applications and are offered in one- and two-piece clamp-type configurations with smooth round, square, hex, and threaded bores. Available in a variety of materials with bore sizes up to 12” I.D., these fully split collars can incorporate keyways and slots on the bore, tapped mounting holes, spanner wrench holes, and other features on the face or O.D. Supplied with alloy socket cap screws up to 1”-8 for optimum holding power, Stafford Large Bore Shaft Collars can incorporate multiple- and extra-large screws for extreme applications. Flange mount shaft collars are also offered in large sizes and can incorporate drilled and tapped mounting holes in any pattern, along with other customer specified modifications. Stafford Large Bore Shaft Collars and Flange Mounts are priced according to material and quantity; available from stock up to 6” I.D. and up to 12” as specials. Price quotations are provided upon request.